We’ve decided to write these up together as one combined trade, but technically there were two different, almost simultaneous moves here. Each party here seemingly had something someone else wanted. The big piece here is actually Ryan Clarke, a somewhat anonymous 21 year old running defender/future midfield type, who appears to be surplus to requirements with the acquisitions this morning of Pittard and Polec, both better at doing the same things right now. Clarke is young and has improved in each of his three seasons at Arden St. He’s not a player who merits feature length essays in the paper on the Sunday after the week’s footy. He’s a role player who does his job. For a 21 year old, that’s a pretty important bar to hit this early in his career. The variance in that prediction, however, is pretty high. For the most similar players to Clarke at the same age, the future results swing from Steve Johnson (211 PAVs from that point on) to Terry Keays (3.2 PAVs). It’s a massive gap. It is likely that Clarke will be able to hit at least 60 PAVs for the rest of his career, with a about a 1 in 5 chance of getting to 100 PAVs (based on other similar careers). As a result, the 70 PAVs that PAPLEY chucks up here is a good middle ground. 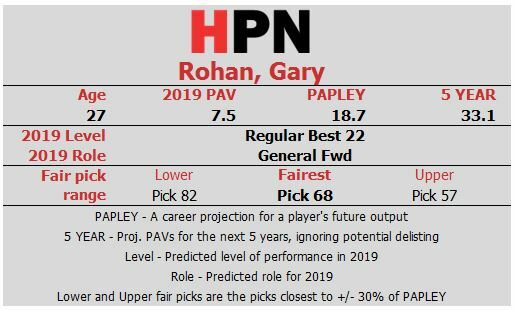 On the other hand, the projection for Gary Rohan is more muted, as a result of his quiet last two years. Rohan has always been a player that has looked better in person than on paper, with his potential still tantalising at the age of 27. But 27 year olds shouldn’t be traded on the hope of potential, and the low price paid by Geelong reflects that. If fit and firing, he should push for senior selection as a speedy pressure forward who can take marks above his head, but those two first parts are very big ifs. 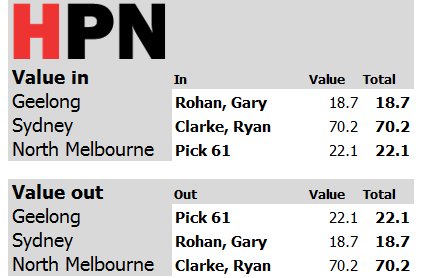 Geelong, in net terms, have turned Lincoln McCarthy plus two 50+ picks into Gary Rohan and Nathan Kreuger, which is a potentially productive renovation of their stock of fringe forwards. Verdict: A big win for Sydney, a hold for Geelong and a loss for North. Legitimately the best analysis I’ve ever read. I am addicted to your articles. The numbers never lie.